The great-granddaughter of Levi Clay (1843-1917), Barbara Inman Beall, Ph.D., published a book about the July 21, 1873 train robbery in Adair Iowa committed by the Jesse James gang. 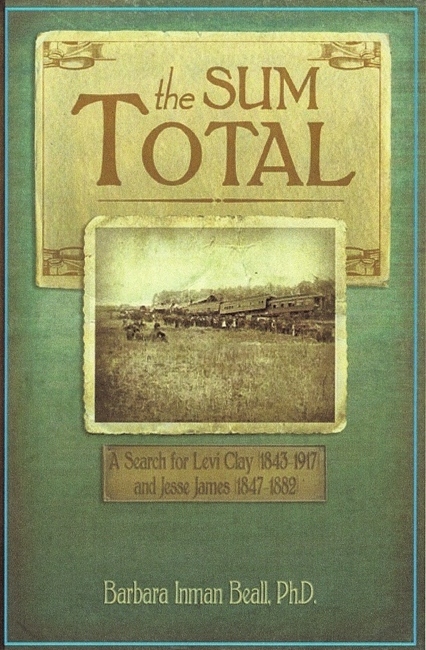 Titled “The Sum Total: A Search for Levi Clay (1843-1917) and Jesse James (1847-1882)”, the book was published in November 2010 by Aventine Press. Dr. Beall first heard the story of the train robbery from her father in 1955. She began her research 22 years ago, and completed the book this fall. An employee of the railroad, Levi Clay was aboard the train that night, and slipped off in the darkness for Casey to send out the alarm. There is a great deal of genealogical information that is incorporated in the book, as well as actual newspaper accounts of the robbery. The author has also included actual photographs from her grandmother, Adelia Clay Inman’s collection. No longer available on Barnes and Noble; available on Amazon on a limited basis from private sellers. I no longer have copies available for sale.